‘This is me in the studio, sitting and thinking after a hard day’s painting. In the background is the canvas I’m working on – so it’s really a painting within a painting. Painting is an ongoing battle; it’s me and the canvas, the paint and the brush. You never stop learning,’ he says. ‘I work in a busy art centre, and there’s always different music playing – country music, gospel, inma (cultural songs in language). 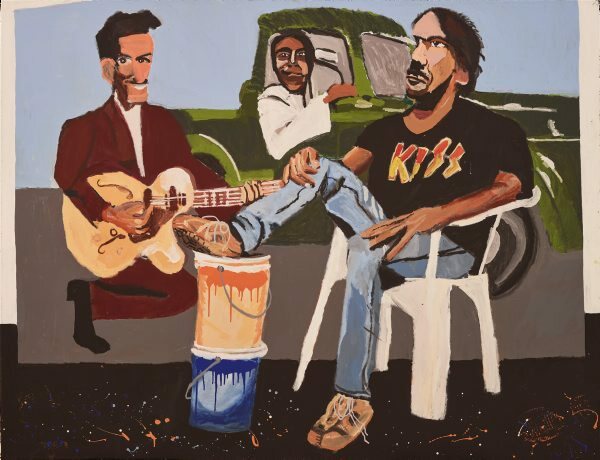 It must have been rock ’n’ roll on this day because I’ve put on the Kiss t-shirt and Chuck Berry is playing his guitar back there on the canvas.